If you're looking at adjusting the looks of the Discounted Pricing Table, like adding colors or working on borders or grid lines, we have a styling tool which allows you to do this! In this article, we are going to style the table to make the borders darker and more emphasized. 1. To start, you'll need to first click on the Settings button on the left navigation panel. 2. Scroll down until you see Discounted Table Settings. To change the design, click on the Design tab. 3. Slide the Override table style to ON. 4. You will then see the different settings to change the style. 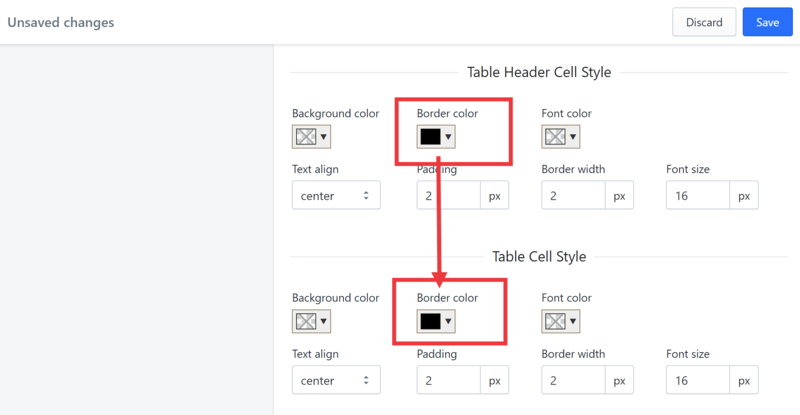 Under Table Header Style and Table Cell Style, choose the border color. You now have a darker and more emphasized discount table. If you run into any problems, please click on the Contact Us below!